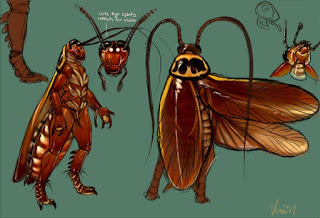 Roaches are a xeno species I am borrowing from Arnold K. This perhaps isn't much of a surprise, since I borrowed his whole setting in Eldritch Americana. Oh well, too late to go back now. I'm building off what Arnold already wrote here. Roaches are short, squat creatures that bare only the faintest resemblance to earth cockroaches. Yes, they've heard all the jokes. They might even laugh politely, in the way that adults do when a child attempts their first knock-knock joke. They are slightly shorter than humans, and slightly hunch over, which does not help. 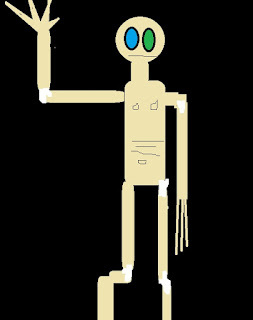 Though their long antennae easily pass all but the top of the tallest human's head. Roaches are very polite, very helpful, and very, very self interested. III. And since we all need the same thing, there is no need for any pretense. Roaches have constructed their society around rational self-interest. They that everyone should be up front with what they need, so that others can bring it to them. Roaches do not haggle*. If you can't give them what they need for their price, they will find someone who will. This overly forward nature also helps reduce crime, they say, because if someone has been telling everyone they need money and then someone gets robbed, you have a possible suspect right there. Those who hide behind pretense in Roach society are viewed as scum, as this is a behavior that criminals and murderers partake in. 'If you have nothing to hide, you have nothing to fear.' But at the same time, the Roaches who sit atop the hierarchy know the value of deception. The higher you climb, the more numerous your friends become, and the more the faker their smiles become. And when you stand atop the world, people will look you in the eye while stabbing you in the back. Roaches believe in hard work, they believe in the pursuit of money, and they believe in knives in the dark. 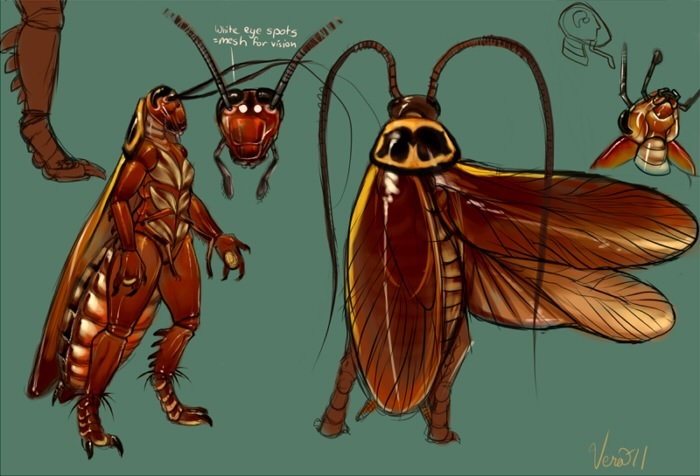 So, because they always looking to gain resources and distribute their excess for a profit, all Roaches are consummately polite and always honest. The best Roaches are the ones who effortlessly embody these virtues, and the worst ones are those who merely wear them as a mask. Everyday Humans love Roaches, as unlike most other Xeno Species they can actually hold a conversation without asking what wallpaper is. Additionally, Roaches go to church (though not your Church), start small businesses and pay their taxes. And sure, they have unusual dining habits, but most Roaches are tactful not to bring that up in public. If you are a Human who has had to negotiate with any group of Roaches you probably have a different opinion of them, most likely something along the line of 'They're polite as they are cutthroat'. It wants to know what you want. It will tell you what it wants. If you happen to have reciprocal needs, it may offer to help, or ask for yours. Roaches are fair, but they do not abide those who squabble over the little details. A moral or low-status Roach (but I repeat myself) will be fair when they make offers to you. They will assume you are a rational actor pursuing resources through whatever means you have on you (just like them, of course). If you help a Roach enough and prove useful and or interesting enough, they may decide to introduce you to their family. Now this is a mistake Humans make all the time. Roach families are not usually composed of the biological children of the members, though it's not like that doesn't happen. Roach families are free associations with strict terms for entering, you have to swear a holy oath before God (their God), and fit a whole bunch of criteria. In short, Roach families are more like communal arrangements, where Roaches support each other and freely share resources among themselves. In a family, it is a second layer of transparency, another device to strip away the layers of subterfuge and pretense that the Roaches are drowning in. For reasons that are never very clear to Humans, Roach families tend to be gender-segregated. Some will admit members from other races, but no members from the opposite gender. Members of a family call each other Brother or Sister, and the Family head is obviously Father or Mother**. So, what do they want from you? 2. A Human business is offering lower prices and undercutting us. Go investigate their premises and make sure there are no accident risks. We want to beat them fair and square. 1. Money. Need a quick loan, no questions asked? Need a place to put your money that your debtors can't find it? Need some loot quickly converted into cash, but it's of a sensitive nature? We can take care of that. For a small fee, of course. 3. Assassination. 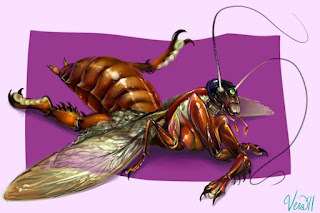 They don't advertise this one on the brochures, but almost every Roach business or family that has even the smallest connection to criminal or illicit business has at least one member who was just recruited for their brutality or skill in combat. Criminal families, on the other hand, have designated Assassins. And for the right price, or the right target, or the right person, Roaches can make people disappear. Roach assassins come in all flavors, with varying level of competency. Some assassins work only for a specific family or church or business, while others work for anyone who will hire them. The most famous assassins in the world are not human, not anymore. 4. Smuggling. Roaches measure status in the form of large balls of dung. These dungballs are accumulated over a lifetime, gradually built larger and larger until they are the size of small houses (if you're lucky and talented). But some Roaches who love money more then status have discovered a secondary use for dungballs. Hollow out a piece of the center and build a false lid. Then wrap any illicit cargo in plastic and store it within. Very few customs officers want to investigate the giant ball of dried dung. And that is basic stuff, Smuggling 101. The true geniuses of the field have much better secrets, stuff that I'm not going to write here. But needless to say, they get results. 5. Miracles. There are people who claim that after going to a blessing by a Roach priest, they were protected. Certain death became an opportunity to escape. It doesn't always work, but the Roaches are among the only people who can actually contact their God and actually get a response, at least, somewhat reliably. Everyone else usually gets nothing, or just sadistic laughter. 6. Off world transit. This is the most fabled thing that the Roaches are rumored to possess. But who knows, it might just be true. I mean, they did come from an alien planet. Maybe they can get you off this rock- if you ask the right one. Humans are like rubber, soft and straining to contain their contents, yet surprisingly tough as well. Their long appendages flap around in the breeze, and they come in a variety of shades. They can't smell to save their lives and their hearing is pretty terrible as well, but their vision is astounding. They only seem to use this incredible vision to notice tiny details in other's physiology and use that as a basis to sort each other into categories. This doesn't make a lot of sense to the Roaches, for whom the primary basis of discrimination has always been religious sect, and not race. Additionally, Roaches can't see as well as humans, so while they can tell the difference between an African and a European, sub-categories within those two groups confuse them, so the Roaches dismiss them. Of course, Roaches will probably never mention this to you. It would be quite rude. *Of course Roaches still negotiate, but they don't make a point of it. A price is a price, and if you won't give them a lower one, or ask too much from them, they will just pack up and leave, even if they desperately need what resource you have. **Yes, Roaches are aware how weird this looks to non-Roaches. For this reason, family business is rarely undertake in public or even when guests are over.